Six artworks from the Repeat and Shift series acquired by The Owyhee. See them now in the first floor lobby. Grant received from the Alexa Rose Foundation will support my fall residency at the Crooked Tree Arts Center in Northern Michigan. The Snake River Seed Library (formerly Common Wealth Seed Library) has commissioned original work by artists Cate Bridgen, Kirsten Furlong, Geoff Krueger, Noel Weber and Amy Westover. Each work is inspired by seed varieties and will later be reproduced as limited-edition seed packets, available for sale in 2015. Portions of the seed library and an exhibition of the artists work will be shown at Ming Studios May 30th-August 30th, 2014. My artwork Alaska Gold: Snowshoe Hare (Lepus Americanus) #2 has been selected for the 2013 Idaho Triennial at the Boise Art Museum by Bonnie Laing-Malcolmson, Curator of Northwest Art at the Portland Art Museum. The exhibition opening reception is November 16th, 2013 5:30-8:00pm and the show continues through April 27th, 2014. During the month of August, I will be working on an environmental art installation at the Boise 150 Sesqui Shop on Main St. in downtown Boise. The reception for the finished project will be August 22 from 6-8pm but stop by anytime during the month to see the work in progress. William Lewis wmlewispainting.com and I are representing Boise in the group exhibition Square Foot at Caesium Gallery in Omaha, NE. The opening is 12/12/12 6-9pm with an additional reception planned for 1215/12 from 7-10pm. Dozens of local and national artists have been invited to show 12"x12" two dimensional artwork in the show. News from the Wilderness: Grizzly Bear has been selected for inclusion in Animalier: The Animal in Contemporary Art, an exhibition sponsored by the Studio Art Program at Northwestern Oklahoma State University - November 2-December 2, 2012. 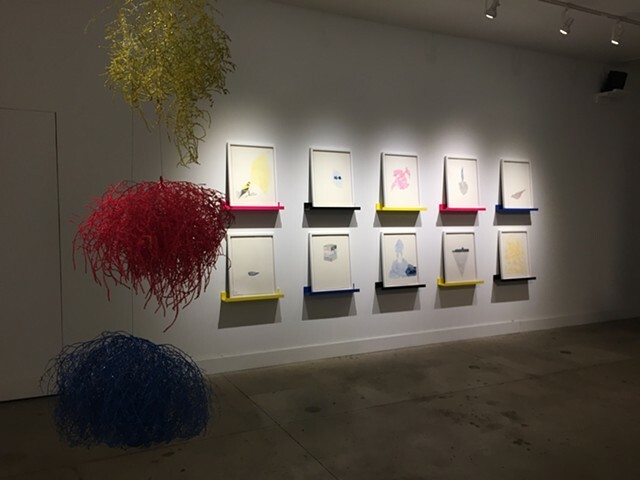 Curator Brandice Guerra, the Grace V. Wisdom Endowed Chair in Visual Art at Northwestern Oklahoma State University, reviewed 127 works from 69 artists in 12 countries and 19 U.S. states and her final selection for the show includes 32 works from 25 artists in 9 countries and 7 U.S. states. News from the Wilderness: Grizzly Bear was created after my 2010 residency at Denali National Park and Preserve in Alaska. Please visit my new traffic box art installed in downtown Boise on 9th St between Idaho and Main Streets. 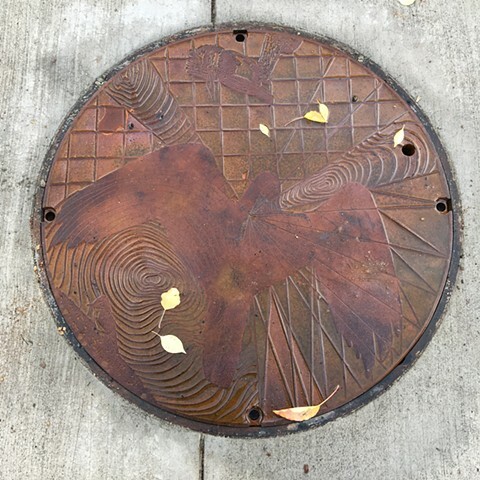 The work is called "Boise's Urban Wildlife" and refers to the animals and birds that visit and live in Boise's city core. Species represented include the pigeon, starling, peregrine falcon, coyote, and mountain lion. The Mayor's Neighborhood Reinvestment Program, Capital City Development Corporation, and Boise City provide funding for the Art Wraps in partnership with the Downtown Boise Association and Downtown Neighborhood Association. Other partners are Ada County Highway District, who owns and cleans the boxes, and Boise's Department of Arts & History, which facilitates artist selection process and project management. Trademark Sign Company fabricates and installs the wraps. Students from NNU's art program visited my studio on Saturday, Oct.6th, 2012 and also visited Boise artist William Lewis and gallery/studio Black Hunger. Big thanks to their professor Amanda Hamilton for organizing the visit. My work was included in a Sept./Oct. 2012 exhibition at Bricolage and Boise Guest House - both here in Boise, ID. The group show featured 20+ Boise and Northwest artists and the artworks included in the exhibition were also made into a set of travel postcards available from the two locations. I will be backpacking in Mt. Hood National Forest with a talented group of artists and folks from Signal Fire based in Portland, OR in July 2012. Visiting artists include Hayley Barker, a painter whose recent works draw from the diaries of Opal Whiteley, acclaimed writer Peter Rock, and Laura Gibson, a singer-songwriter whose finely wrought lyrics revel in the complexity of the natural world. I have teamed up with Susan Medlin of the Treasure Valley Food Coalition to organize an exhibition of Idaho artists whose work addresses issues related to food. The show will be on view through May 23rd, 2012 at Visual Arts Center - Gallery 2 in the Hemingway Western Studies Center. Read Tara Morgan's Boise Weekly article about the show HERE. I have curated an exhibition entitled Cutting Edge: Contemporary Paper which will be open through March 23rd, 2012 at the Visual Arts Center - Gallery 2 located in the Hemingway Western Studies Center. Read about the exhibition in the Idaho Statesman and Boise Weekly. Northern Exposure:Kirsten Furlong Goes North to Alaska by Tara Morgan. I will spend two weeks this winter at the Brush Creek Foundation for the Arts residency program starting a new body of work. Brush Creek is near Saratoga, WY between the Sierra Madre and Snowy Mountain ranges on the high plains of South Central Wyoming in the North Platte River Valley. Kirsten Furlong’s North to Alaska opens at The Gallery at the Linen Building Sept. 30, 2011. The exhibition showcases work inspired by the Boise artist’s 10-day residency at Alaska’s Denali National Park and Preserve. Opening reception at 6:30 p.m. Friday, Sept. 30, 2011 at The Gallery at the Linen Building, 1402 W. Grove St. in Downtown Boise’s Linen District. Admission to The Gallery is free. An artist dialog will be held at 5:30 p.m. Tuesday, Oct. 25, at The Gallery. North to Alaska will run through Dec. 18th, 2011. I am participating again this year in the More Than a Pretty Face program at the Boise Art Museum. If you are interested in commissioning an artwork and supporting BAM, please find more information at their website. Spent two weeks in Denali National Park in the historic Murie Cabin as part of their artists in residence program. The trip was supported by Denali National Park, Alaska Geographic, the Idaho Commission on the Arts, National Endowment for the Arts, and the Boise Weekly Individual Artist Cover Auction Grant. In 2011 I will have artwork in the permanent collection at Denali and an exhibition of work in response to the experience at the Gallery at the Linen Building, Boise, ID. I will have three paintings, two prints, and a 24 foot cut paper installation in the exhibition "Birds of a Feather" at the Boise Art Museum. This exhibition is running concurrently with a show of John James Audubon prints from the Birds of America. Artist William D. Lewis and I will be creating special artwork and a performance to be shown at Modern Art at the Modern Hotel this year. Please come by and look through the window of room 117. Commissioned artwork from local artists who participated in the More Than A Pretty Face program will be presented at BAM following their unveiling at the Gala on April 24th. Commissioned local artists include: Chris Binion, Divit Cardoza, Jill Fitterer, Kirsten Furlong, Ward Hooper, Geoff Krueger, Benjamin Love, Kathy Harrison Mahn, Surel Mitchell, Shelley McCarl, Christine Raymond, Shantara Sandberg, Amy Westover, Liz Wolf, and Karen Woods. The Basement Gallery in Boise has new owners and is showing new work and new artists from Boise and England. I will be showing some polyester-plate lithos and solar plate prints in March/April 2010. 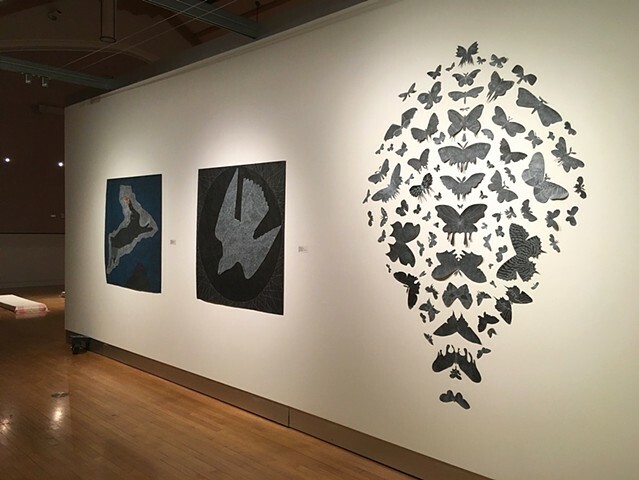 My cut paper installation "Twice: Migration" was included in the exhibition "Nest and Branch" curated by Zoe Cohen at the Schuylkill Center for Environmental Art in Philadelphia, PA. I was able to visit and install the work in December 2009 - this is a great place - I particularly like their "On the Trails" series of outdoor exhibitions. SQFT curated by TJ Norris will travel to Boise. I will be working at the 8th Street Marketplace Artist in Residence program May 1-July 30th, 2009. Stop by the studio during First Thursday of May, June, and July. This exhibition includes works on paper and a new installation. 2009 North American Print Biennial curated by Roberta Waddell. "Drawn by Doppelganger" #15 was selected from over 1900 prints submitted. and Curator of Graphic Arts at The Toledo Museum of Art. of the crazy eight themes, "Autobiography". don't miss the opening reception Friday, August 8th at 8pm. Join us for drinks and appetizers. Artist Kirsten Furlong will discuss her work at 6pm. wonderful train drawings by artist William Lewis. through April 4th, 2008 www.uidaho.edu/galleries/exhibitions/fe? Nicol, Kirsten Furlong, Scott Kolbo, and Kimiko Miyoshi. Emily Arthur Douglas, and portfolio organizer Melanie Yazzie. Reception March 21 5-7pm during the BSU First Nations Conference. A limited selection of toys created by local artists. Idaho Triennial exhibition at the Boise Art Museum. Exhibition September 1st-November 25th, 2007. "Pushing Process: Contemporary Printmaking in Boise"
EveMarie Bergren, Jill Fitterer, Kirsten Furlong and Amy Westover.